"Some on the left have always tried to introduce a more class-conscious style of politics. These efforts never pan out. America has always done better, liberals have always done better, when we are all focused on opportunity and mobility, not inequality, on individual and family aspiration, not class-consciousness." Funny, I thought Social Security, the Fair Labor Standards Act (i.e. the 40-hour workweek), the National Labor Relations Board, and other products of the New Deal were pretty big accomplishments. Much of this was done quite explicitly with a sense of class consciousness. These were all measures that were backed by mass movements that sought to ensure that working people got their share of the economic pie. Good thing we have David Brooks to tell us the opposite. "Consistent with some other studies, they find no evidence that such raises had any effect on the poverty rates. "That’s because raises in the minimum wage are not targeted at the right people." Actually the Sabia and Burkhauser study goes against the overwhelming majority of other studies on the topic as summarized in this analysis by University of Massachusetts professor Arin Dube. "Third, the income inequality frame contributes to our tendency to simplify complex cultural, social, behavioral and economic problems into strictly economic problems (italics in original). "There is a very strong correlation between single motherhood and low social mobility. There is a very strong correlation between high school dropout rates and low mobility. There is a strong correlation between the fraying of social fabric and low economic mobility. There is a strong correlation between de-industrialization and low social mobility." Actually the problem of single motherhood is a problem of the United States providing inadequate support for child raising. Many other wealthy countries higher percentages of children born out of wedlock and the percentage of children in single parent families in the U.S. is not that much out of line with the average for other wealthy countries. However no other wealthy country has a poverty rate for children that is remotely comparable. Rather than fixing our system of social supports such as guaranteeing paid family leave and sick days and childcare, Brooks wants big government to tell people who they should live with and love. It's not clear what social fabric Brooks thinks is fraying. The percentage of children in single-parent families has actually largely stabilized in the last three decades. The percentage of teen mothers is way down as is the crime rate. The high school graduation rate is way up. These changes have not been reflected in improved conditions for those at the bottom as minimum wage workers are more educated and experienced than ever. As much we might want to take David Brooks' plea for considering complex cultural, social, and behavioral problems, de-industrialiation looks pretty much like a good old-fashioned economic problem. An over-valued dollar makes our goods uncompetitive internationally. If the currency is over-valued by 20 percent it is roughly equivalent to having a 20 percent tariff on all U.S. exports and a 20 percent subsidy on imports. In addition, if we have trade agreements that expose manufacturing workers to competition with low-paid workers in the developing world, while largely protecting highly paid professionals like doctors and lawyers, then we will have a serious problem of deindustrialization. That's pretty much economics 101, it's hard to see why any bigger explanation is needed on this one. In fact Brooks tells us we have the story all wrong in seeing the dismal plight of the bulk of the population as being in any way linked to the riches of the one percent, who he politely hides behind the next four percent of the income distribution. Brooks tells us that the incredible wealth of the top one percent is a different story from the problems faced by the rest of us. "At the top end, there is the growing wealth of the top five percent of workers. This is linked to things like perverse compensation schemes on Wall Street, assortative mating (highly educated people are more likely to marry each other and pass down their advantages to their children) and the superstar effect (in an Internet economy, a few superstars in each industry can reap global gains while the average performers cannot)." First, it is just wrong to attribute the run away wealth and income at the top to five percent of the work force. Those in the 95th to 99th percentile are roughly getting their share of the growth of the economic pie. It is only the top one percent and primarily the top 0.1 percent who are really pulling away. And Brooks has seriously misrepresented the causes of their runaway wealth. His "superstar" story depends largely on changing rules in ways that support this concentration of income and wealth. For example, we have had the lengthening and strengthening of copyright laws. Strict enforcement of these government granted monopolies is very important for concentrating wealth in the modern economy because the Internet would otherwise let everyone have copies of everything at no cost. The same applies to patents. They have transferred vast sums to those at the top while making the rest of us pay much more for drugs and high tech products. The top one percent have also thrived from a tax code that lets private equity fund managers get incredibly rich by finding clever ways to game it with large amounts of leverage. And we have a failed structure of corporate governance that allows CEOs to effectively pay off corporate directors to ensure their own high pay. "If you have a primitive [the origin of the name-calling in the headline] zero-sum mentality then you assume growing affluence for the rich must somehow be causing the immobility of the poor, but, in reality, the two sets of problems are different, and it does no good to lump them together and call them 'inequality.'" Fans of arithmetic everywhere know that if the rich get more, and the economy is not growing faster, then everyone else gets less. (It might be primitive, but it's true.) And the economy has been growing very slowly for the last thirteen years and actually pretty slowly for the whole period in which inequality has been increasing. "Democrats often see low wages as both a human capital problem and a problem caused by unequal economic power. Republicans are more likely to see them just as a human capital problem. If we’re going to pass bipartisan legislation, we’re going to have to start with the human capital piece, where there is some agreement, not the class conflict piece, where there is none." Actually, there are many honest conservatives who are opposed to the rent-seeking that allows so many of the one percent to get rich at the expense of the rest of us. Patent and copyright reform are great places to start, as are trade agreements that subject our doctors to the same sort of competition that our autoworkers and steelworkers have enjoyed for decades. And, we can get rid of some of the abuses in the tax code that exist to make the Mitt Romneys of the world rich. That's a great agenda that can draw bipartisan support and make a serious dent in inequality. Correction: An earlier version said that many other wealthy countries have higher percentages of children in single parent families. The United States actually ranks near the top in this category, although not that far above the OECD average. 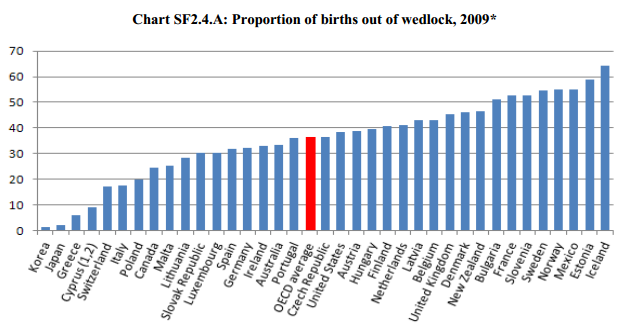 It is right at the OECD average in the percentage of children born out of wedlock.